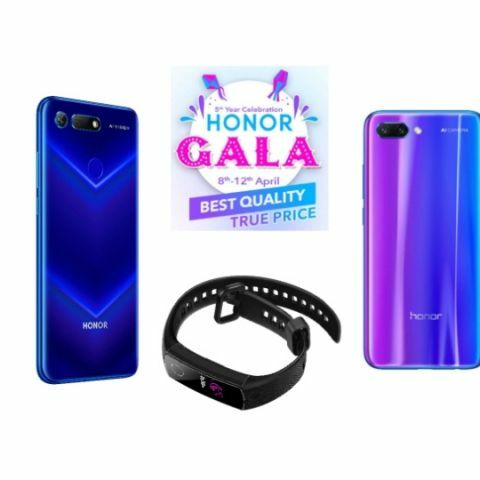 As a part of its five-year celebration in India, Honor’s Gala Sale has commenced today on two of the major online platforms, Flipkart and Amazon. The smartphone manufacturer has announced a slew of deals and discounts on its products, which includes handsets like the Honor 9N, Honor Play, Honor View 20 and more. Additionally, the company’s tablets and wearables are also up for grabs at lowered prices. The Honor Band 3, Band 4 and Band 4 Running and the Honor Watch Magic are on sale at discounted prices. Here. we are listing some of the best deals across the two e-commerce platforms. The Honor View 20 is the high-end flagship smartphone that is currently available for Rs 37,999. The device features a 6.4-inch FHD+ display and is powered by the Kirin 980 SoC, coupled with 6GB RAM with 128GB of internal storage. The phone features a 48MP + 3D TOF primary camera setup. The Honor 10 features a 5.84 inch Full HD+ display and is powered by the Kirin 970 SoC. It comes with 6GB RAM, which is coupled with 128GB of storage and is backed by a 3400mAh battery. It runs on the Kirin 970 SoC and sports a 24MP + 16MP rear sensors, along with a 24MP front facing. It is currently listed at Rs 24,999. The Honor Play is powered by the Kirin 970 SoC and sports 4GB RAM with 64GB of expandable storage. The handset features a 6.3-inch Full HD+ display with a 2340 x 1080 pixel resolution and is equipped with a 16MP + 2MP dual rear camera setup and a 16MP front facing camera. The handset is available at a discounted price of Rs 13,999. The Honor 8C is up for sale at lowered price of Rs 8,999. The phone features a 13MP+2MP dual rear primary camera setup and it comes with an 8MP front facing camera. The 6.26-inch display on the phone features a 1520 x 720 pixels resolution and comes with 4GB RAM and 32GB of internal memory . The Honor 7A was launched in India priced at Rs 8,999 but it is currently available at Rs 6,999. The entry-level phone features a 5.7 inch HD+ Display and is powered by the Snapdragon 430 SoC. It comes with 3GB RAM and 32GB of internal storage and is equipped with 13MP + 2MP dual rear camera setup. On the front it sports an 8MP sensor. It is backed by a 3000mAh battery. The Honor Band 4 features a 0.95 Inch AMOLED Touch Screen display. The device features sleep monitoring, heart rate monitoring, and 5ATM water resistance. It is touted to deliver standby time up to 17 days. The device features Multiple Sports Modes and tracks outdoor activities like running, walking, cycling, swimming and more. The Honor band 4 is priced at Rs 2,499. The Honor Watch Magic features a 1.2-inch AMOLED display and sports multiple watch faces with ALS ambient light monitoring. The device is said to last up to one week on a single charge. It sports continuous heart rate monitoring, “scientific” sleep tracking, and is 5ATM water-resistant. The device has received a Rs 1,000 discount and is priced at Rs 12,999. The Honor MediaPad T3 is priced at Rs 9,499. The device sports an 8-inch display with a 1280 x 800 pixel resolution. It sports a 5MP main camera and a 2MP front sensor and runs on Android 7 Nougat with EMUI 5.1 on top. The device is powered by the Qualcomm MSM8917 quad core processor and is equipped with 2GB RAM with 16GB of internal memory.